Jakarta Governor, Anies Baswedan, attended the Jakarta Souvenir Design Award 2018, at Jakarta Creative Hub, Tanah Abang, Central Jakarta, Saturday (12/1). Appreciation was dedicated to the souvenir creators as one of the supporting elements of cultural, artistic and tourism activities.
" It is hoped that there will be a process of making these souvenirs mass products"
"It is hoped that there will be a process of making these souvenirs mass products that can be used in many places," he expressed. According to him, it is important for all parties to promote each other's chosen souvenirs to the wider community to be better known. "Therefore the need for souvenirs in Jakarta is very high. If we can be serious about these results, thus these works will arrive at important spaces in all corners of the world," he stated. The award itself took theme "Spirit of Jakarta : Cultural Variety and Flora Fauna Jakarta". 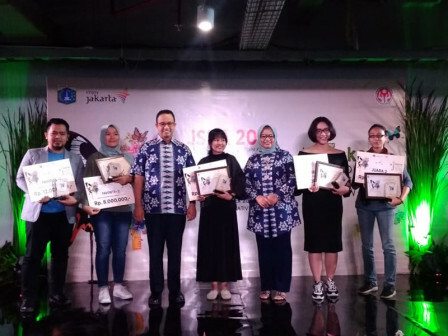 It was held by the Jakarta Regional National Body (Dekranasda) to support the young designer to be more creative in creating souvenirs that are typical of Jakarta.